Setup AlfI digestion of the 10 samples that were dried down and reconstituted on Monday following the Meyer Lab’s protocol. The SAM that was ordered was at .5 mM, so I made a dilution to 150 uM by adding 30 uL of stock to 70 uL of water. Protocol calls for at least 1 hour at 37degC and up to overnight, so I set it for 2 hours followed by 15 minutes at 65degC. Some digests look good (SS_2_3, SS_2_5,HC_1_2,HC_1_3,NF_1_2, HC_1_4), some don’t look very degraded (SS_2_4) and some the DNA is degraded making it hard to tell (HC_1_1,NF_1_1,NF_1_3). For some reason NF1_3 dna does not show up at all- must have pipeted incorrectly. NF_1_1 and NF_1_3 looked degraded on the initial gel run, but weirdly HC_1_1 looked fine. I had to keep drying some of the samples after 10 minutes in the centrivap, which may have impacted DNA quality. Will talk to lab tomorrow, but my gut is to go ahead with library prep and sequence these on the MiSeq. If the 3 degraded samples have low read coverage, we’ll know how DNA quality effects library quality. This entry was posted in Lab Notebook, Puget Sound Oly Common Garden and tagged 2b-rad, Fall 2015 by ksil91. Bookmark the permalink. I know this is written in the Meyer protocol, but what are your thoughts on using the 10x Buffer R at a 3x final concentration in the digestion reaction (instead of a 1x final concentration, as is the normal usage)? And, the Meyer protocol is using SAM at a final concentration of only 30uM (which is equivalent to 0.08X final concentration of the 50X SAM stock). Do you have any idea why they might’ve made these changes to something as straight forward as a restriction digest? Turns out I’m an idiot, so please disregard my initial comment. The buffer dilutions are fine because the final reaction volume is 12uL! Duh! When looking through the protocol, I totally neglected to take the additional volume the DNA would contribute to each individual reaction. I don’t know the answer to those questions, but yeah the amount of SAM seemed really low. 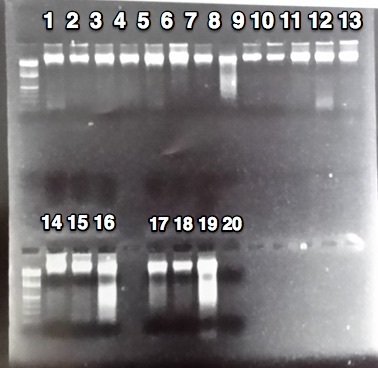 For GBS, I just used NEB Buffer 3 and the restriction enzyme (ApeKI) so I’m not really familiar with using R and SAM. I suspect it has to do with AlfI being a Type-IIB restriction enzyme and therefore functionally different in how it cuts compared to Type-II. I can ask Eli if you want.